This was taken at the University of the Philippines Los Banos (UPLB) Museum of Natural History in Laguna. The kids consider this field trip as one of their memorable school activities. They saw preserved biological and zooligal specimens like the stuffed owl above at the museum. 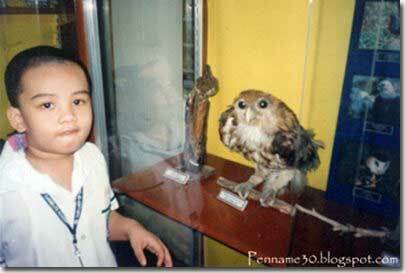 That’s my son Khalil with “Hedwig” (the owl in Harry Potter ). My entry for Camera Critters. Have a great week ahead everyone! This entry was posted in Uncategorized and tagged school field trip, stuffed owl, UPLB National Museum of Natural History on October 10, 2010 by Yami.